Extended Day child care team members from EDCOE were welcomed back from summer break with an “It’s Funtastic!” in-service training day. 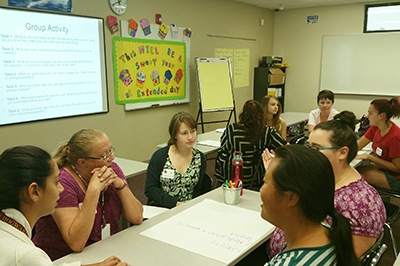 The in-service, which is part of a regular professional development model, allowed staff to gain crucial knowledge on a variety of topics designed to ensure that Extended Day continues to provide outstanding service to families in the community. Guest speakers presented information on different ways to provide fun and engaging program elements for students, and in addition there was training on a variety of other topics, including epi-pen regulations and administration, common medical concerns, the program’s new website, and various personnel information. “The day was filled with positive energy, and our team received great training to ensure another successful school year,” Extended Day Program Supervisor Lori Scalaro expressed. More information about Extended Day can be found on the program’s website at http://eday.edcoe.org/ or by calling (530) 295-2298.